Years ago, I used to use this great shampoo that would bring the highlights out in my hair while brightening the blonde color. It was a purple shampoo and I cannot recall the name but I looked over and over for it and never could find it. I've tried other brands of shampoo that claims to do the same thing but none of them did. When Joni Rae & Associates offered two bottles of Pravana Natureuticals products to try, I definitely wanted to after I looked up what their products were. I don't just review any product and when I pick one to review, I have to have a reason versus having something to post about. 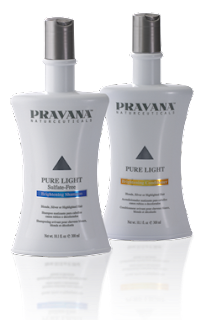 Pravana has a host of hair care products but for this post, I'm focusing on the Pure Light line. Pure Light is a brightening shampoo and conditioner in a deep, pretty purple color and an amazing fragrance. If you are a blonde or have gray hair, you know the importance of using a purple based shampoo and conditioner on your hair. You achieve the maximum results with this. What's even better is the Pravana line is the first sulfate-free cleansing and conditioning system formulated to instantly brighten and whiten blonde, highlighted or natural silver/white hair. Removing yellow tones is such a huge bonus to any shampoo and conditioner. If you have blonde, highlighted, silver or white hair, I highly recommend the Pravana line. It really works but for me, I found I can't use it daily due to the powerful effect it has in working. The fragrance alone is worth purchasing it. I've never had a hair care product smell so good. To find a salon that carries Pravana, click here.